Global warming may not have much effect on those in the U.S. Midwest, but others may find it very difficult to “Just adjust”. Redbud that thinks it's Spring. Pears that have not seen frost by Thanksgiving. These are not great pictures, but I was not planning to write an article when I took them the day before Thanksgiving this year. But, they have a message. 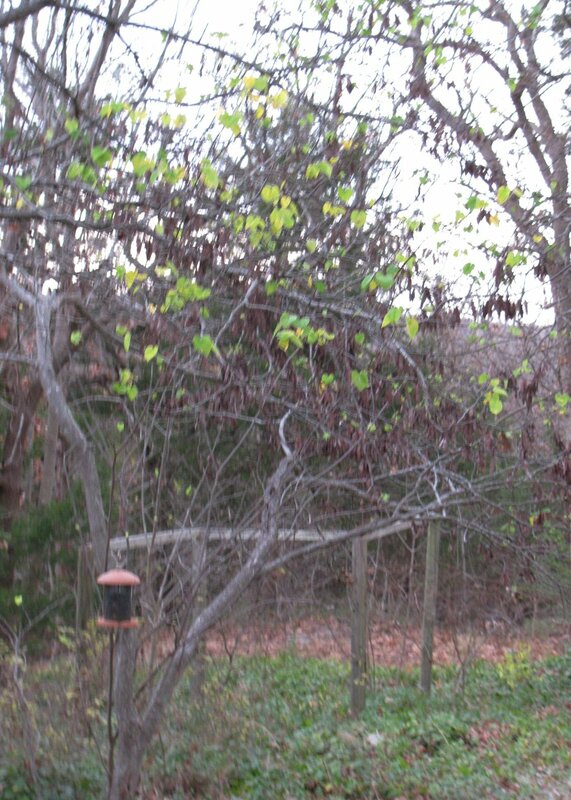 One shows our redbud tree that budded into green leaves as if it were Spring after going dormant for the year. The pear tree still had pears and green leaves not yet bitten by frost. They reminded me of my family’s Thanksgiving photo taken in front of my dad’s apple tree in1998. We were all in shirtsleeves and the apple tree still had green leaves, as it had not yet frosted that year. My father, then 88, said that never in his memory had a frost been so late. It turned out that 1998 was one of the hottest years on record but this year may set a new record. It is interesting that two of the latest frosts in our area in almost a century have occurred after Thanksgiving – and in the past 12 years. Other subtle changes have taken place in my lifetime. We used to be in gardening zone six but we are now in zone seven. That means we are now having warmer winters, later frosts, and earlier warm-ups in the spring. Several times our fruit trees bloomed during a false spring in February only to have the blossoms nipped by a later freeze. We have a longer growing season which sounds good. That also means a longer season for insects and pests and they have shown up in greater abundance. Our gardening is a hobby so it is not a serious matter if we lose a crop to early freezes or pests. We recently have had record rainfall in the spring and three years ago the ground was wet for so long it drowned some of our fruit trees. But, we are now experiencing dryer weather in late summer and early fall – and the redbud tree in the picture had its leaves turn brown by September from dry weather. Scientists cannot predict the weather but only that the warming Earth will cause weather to become more extreme – and we seem to be observing that. The signs of a warming Earth are sometimes subtle and it is rather hard to tell if that is the cause of changes we see. Biologists are telling us that some species are extending their range to the North. We now have fire ants and armadillos which were not around when I was growing up. I recently found some Kudzu growing over at the lake and some along a fence near my house. Kudzu is an invasive plant that chokes out other vegetation and kills trees; it thrives in higher CO2 levels and warmer temperatures. I certainly hope it doesn’t get started here. And sadly, the quail which were plentiful during my childhood have disappeared from the hills and fields in this area. Some say foraging armadillos are responsible by destroying their nests, but no one really knows for sure. I’m not sure the quail’s disappearance had anything to do with global warming but they have come to symbolize for me that subtle changes are taking place. It’s sad that good things may change and my grandchildren may never be aware of the things that are gone. There is sound scientific evidence that the Earth is warming and those who long denied the evidence have now shifted their message, saying we should “just adjust”. I’m not sure what that means, but those of us who live in the Midwestern United States will probably be able to do so. It may be more difficult for other people in the world. The people of Kashmir are concerned that the glaciers that feed their streams in the summer are receding – making less water available. The Sherpa of Tibet are worried that their villages may be flooded by lakes that now form each summer from melting glaciers . The lakes are held back by ice dams and, if a dam breaks, it will be a catastrophe for their villages. The Inuit in the Arctic are having to move their coastal villages to keep them from being eroded away by wave action of open seas which were year round ice before. Their inland villages are threatened as well as the permafrost upon which some were built now becomes a quagmire in the summer. Telling the people whose lives will be changed forever by global warming to “just adjust” seems a little hollow. This entry was posted on Friday, December 10th, 2010 at 3:48 pm	and is filed under Climate Change. You can follow any responses to this entry through the RSS 2.0 feed. You can leave a response, or trackback from your own site. Hey There. I found your blog using bing. This is a very well written article. I will be sure to bookmark it and come back to read more of your usefull information. Thanks for the post.